Hello everyone! Today I have China Glaze Immortal with Enchanted Polish To Die For added at the end. I like to try to show you a mani every step of the way because so many times I’ve seen a post on a blog with the finished mani (stamped or with glitter or whatever) and I wonder to myself, “I wish I could see this mani before they changed it up”. So I try to do that in case you like to see. Anyway, China Glaze Immortal is from the Halloween 2012 Wicked Collection. Good news is this polish is still available (as of my writing this post anyway) on Amazon! Immortal is medium/dark gray with multi colored shimmer. The formula was excellent! One of the best I’ve used recently! I used 2 coats plus topcoat for the pictures. 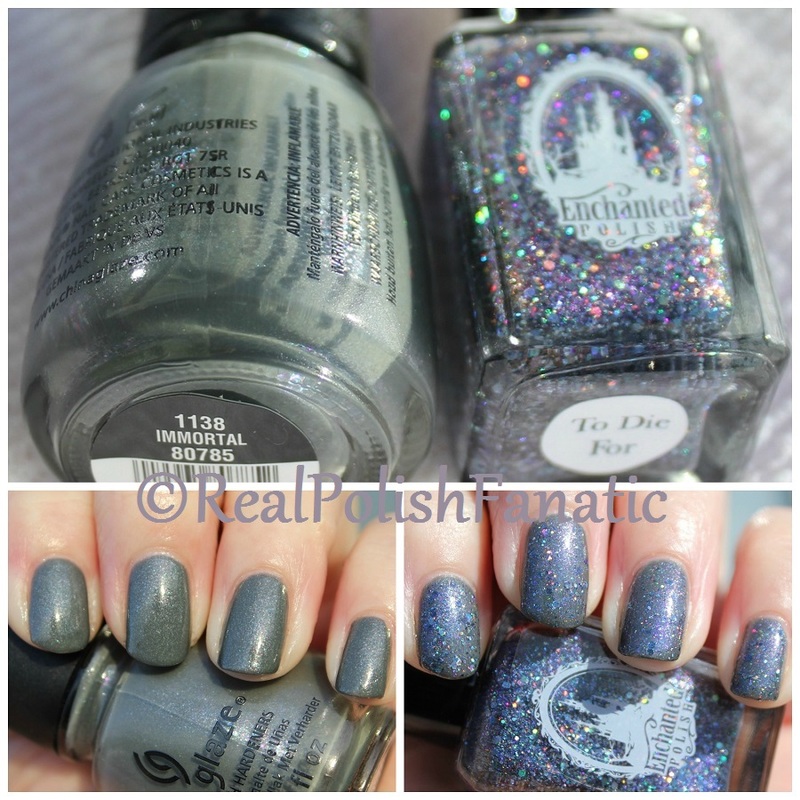 Enchanted Polish To Die For is also actually available for sale right now on the Enchanted Polish website. I have in my spreadsheet that To Die For is a clear base, but my bottle is a lightly gray tinted base with small and micro holo glitter. There’s also some sort of pink to purple shifting shimmer I think. Whatever it’s made up of, it really works! And I think it looks great over Immortal! Formula of To Die For was also excellent. Great glitter distribution. No fishing or dabbing for the glitter. It just smoothly brushed on. It also dried pretty smooth. One coat of topcoat is sufficient unless you want a finish that is smooth as glass, then you may need two coats of topcoat. I used just 1 coat of polish and topcoat for my photos. China Glaze Immortal, 2 coats plus topcoat & Enchanted Polish To Die For, 1 coat plus topcoat. Well, there’s another Halloween themed mani! I’m really loving this one!